The Nissan Serena wasn’t one of Nissan’s finest hours. A practical seven-seater MPV, it found a home with the mini cab drivers of this world but didn’t win many friends in retail. The fact that, for a very long time, it was the slowest accelerating car on the roads summed up its appeal. 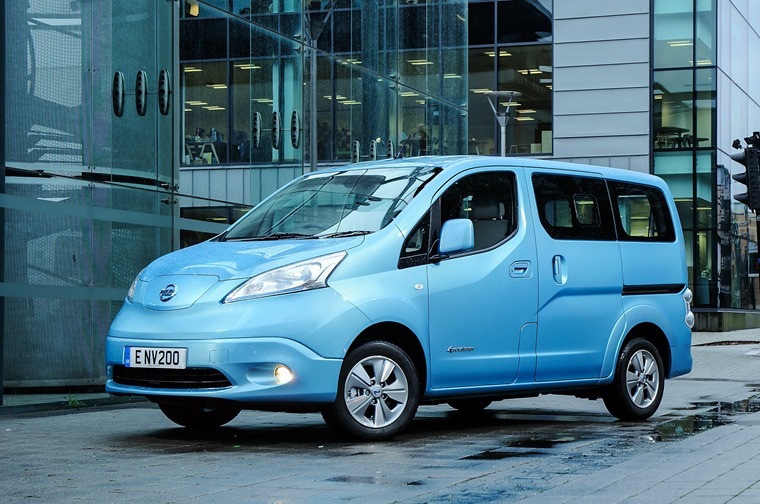 The NV200 is, if you like, the spiritual successor to the Serena and the e-NV200 the next logical step to that. While the range of the first-gen e-NV200 was set officially at 106 miles, the 2018 model extends to a far more impressive and useable 174 miles thanks to the latest 40kWh battery pack from the all-new Nissan Leaf. Realistically, 120 miles of mixed use should be possible without any problems; my time in the e-NV200 started with a full battery and the computer showing 125 miles of range, and that dropped almost exactly mile for mile. There’s the very appealing instant power that all electric vehicles provide which makes it feel quite zippy at low speeds, but the 108bhp motor soon runs out of oomph leaving anything over 50mpg feeling quite strained. It’s limited to 76mph but it feels strained long before it gets there, although there’s always enough to join a motorway without fearing for your life. Once up to motorway speeds there’s enough juice to keep it there too. The near silent running at lower speeds doesn’t quite carry on to higher speeds, but rather than that being some quirk of the drivetrain it is thanks to excessive wind noise. Despite the compact nature of the car it still resembles a slightly curvy wardrobe, so aerodynamics will play their part. Stay within the city and it’s an altogether more compelling proposition, where the characteristics of an electric drivetrain makes the vehicle feel most at home. 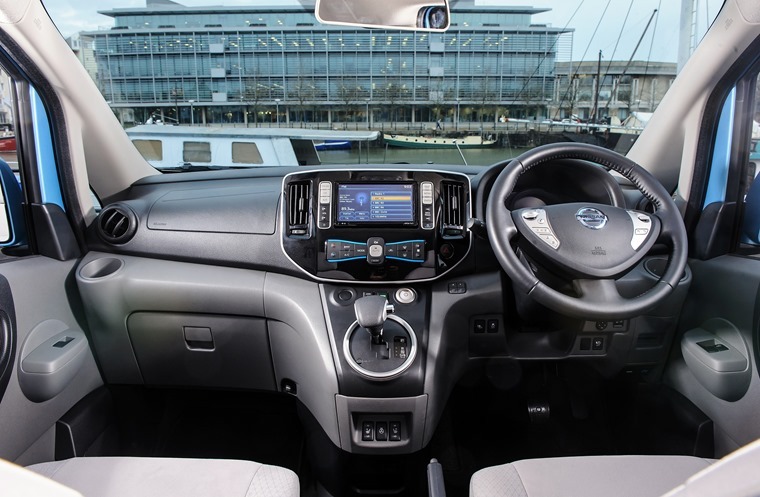 The increased battery capacity and the quiet ambience provided by the electric motor transforms the e-NV200 into something that can be relied upon all day, requiring just a recharge overnight. All models are compatible with 50kW CHADEMO charging points which enables bi-directional charging from the low battery warning level to 80% in around 40 minutes. There’s also a 6.6kW charger built into the e-NV200 for home and work charging, although resorting to a three-pin plug could take a whole day to charge the car. 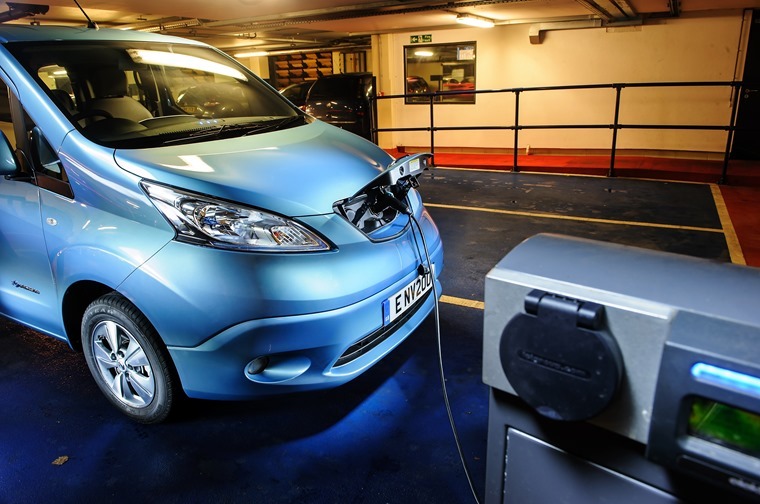 Nissan will install a free fast charger for buyers for more convenient plugging in and more sensible seven hour charge times. 50kW CHADEMO charging points enables bi-directional charging from the low battery warning level to 80% in around 40 minutes. As an electric vehicle then, it does the job. As a seven seat people carrier? The e-NV200 squeezes everything into just 4.5 metres of road space - barely any more than a Ford Focus - which means squeezing in seven people is going to lead to some compromises. There’s front-wheel drive that leaves a flat floor in the cabin, but that still leaves things rather tight. The front two seats are, as you would expect, absolutely fine. There’s not much in the way of room to spare, but getting comfortable isn’t much of an issue and the seats and cockpit area are well sized and shaped. The driving position is a little compromised, with the steering wheel not adjusting for reach and leaving most a little nearer the heavily offset pedals than might be ideal. Things start to get tight on the second row, where there’s just about enough legroom while shoulder room is lacking for three adults - it really requires the one in the middle to lean forward a tad. Sadly, it gets worse. The rearmost seats fold down from the side of the vehicle like an old military Land Rover. Once the legs are locked in place, it leaves an uncomfortable and cramped area to sit in. Knee room is almost non existent, while there’s little support for the back. It’s fine for a short hop home after a night out but you’ll win no friends by putting people in the back for a long journey. Pleasingly, with all seven seats in place, there’s just about enough room for a couple of decent size suitcases in the back. Reign it back to being a five seater and there's more space than you might know what to do with. 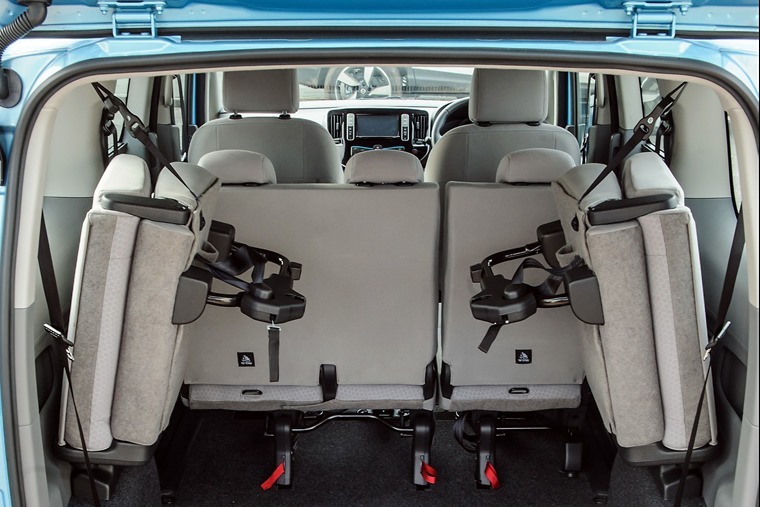 Using just one rear seat and running the e-NV200 as a six-seater offers the best of both worlds, with plenty of luggage storage and plenty of seating although there’s nothing to keep any errant bags away from passengers legs. If the passengers suffer a little, at least the driver fares better. A digital instrument panel keeps the driver aware of the state of battery charge, remaining range and such like, while the centre stack is dominated by a touchscreen infotainment system. This works well enough and houses audio, navigation and other ancillary controls. Pleasingly, heating and ventilation controls sit below with proper physical buttons, while there are shortcut buttons on either side of the screen for frequently used features. 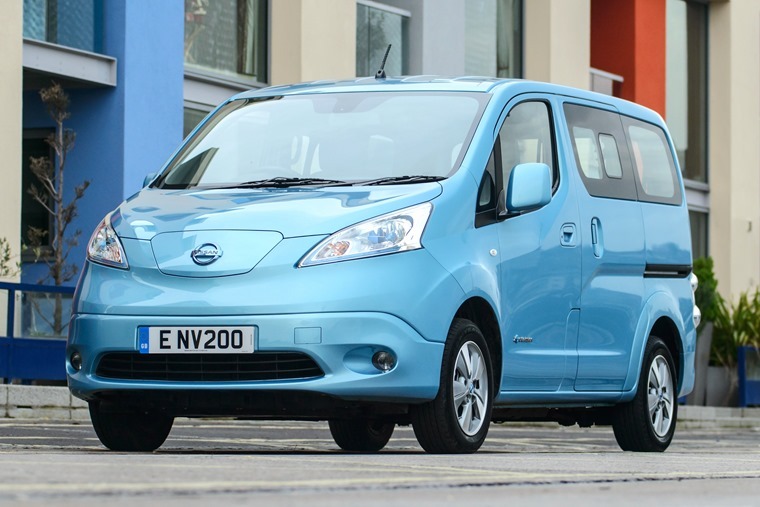 For the private hire, airport chauffeur or big-city minicab market, the e-NV200 makes a lot of sense. Lower down in the cabin there are hard, scratchy plastics that feel resilient and bolted together well. There’s plenty of pockets, cubbies and cupholders, so storage for phones and paperwork won’t be a problem, but the single USB socket might be limiting for a car that can seat seven. The bottom line is that the e-NV200 doesn’t really work as a family car. However, it’s not without its positives. For the business owner, perhaps a taxi driver, there are lots of upsides. It’s not an expensive vehicle so leasing costs are expected to reflect this, while business owners will appreciate the 100% write down allowance that makes it more tax efficient. Zero rated car tax, low maintenance costs and electricity being cheaper than diesel add further to the cars appeal, while drivers will avoid the London congestion charge and indeed any restrictions likely to come in from other UK cities. That’s one hell of a competitive advantage if you’re moving people around for money. For the private hire, airport chauffeur or big-city minicab market, the e-NV200 suddenly makes a lot of sense. It’s a bit van-like in how it does things - which is understandable as there’s a proper van version available - and it’s not a vehicle that will excite many, but Nissan has managed to effectively merge the best bits of the NV200 with the best bits of the new Leaf to create something that will make a great deal of sense to some.